Backwashing or backwash is the process of scrupulously cleaning a pool’s filter by the way of reversing the water flow to flush out debris and dirt. This ensures that your filter gets clean without manually cleaning it and it takes just a couple of minutes. To be successful, you need the best pool backwash hose that will clear out every contaminant from your filter. But with so many brands and models of these hoses being offered today, it can be almost impossible to know which one to choose. 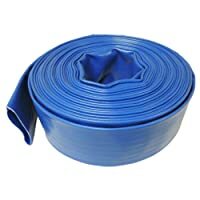 Below I will look at the top backwash hoses to help you choose the best for your swimming pool needs. There are a lot of hoses out there but below are the top 5 pool backwash hoses on the market today. 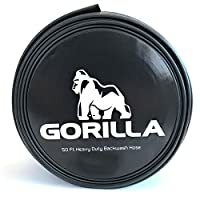 The GORILLA Backwash hose is 5 times stronger than ordinary blues hoses, making it a perfect hose for backwashing your pool filter. It is a heavy-duty model that is reinforced with commercial grade PVC material and is custom made to fit swimming pools. It is built with the toughness of a GORILLA and made to last for years, which is guaranteed. Every hose features a stainless steel hose clamp that you can use to lock your hose when not in use or when transporting it from your garage to your pool. Moreover, the hose is made to fit over a normal size pool filter outlet and it has a diameter of 2 inches. Hence, your filter outlet needs to be at most 2” for it to fit. 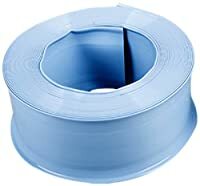 This is a heavy-duty hose that is referred to as discharge hose, lay flat hose, construction hose, backwash hose, pump hose, or pool discharge hose. The hose is ideal for use with light chemicals, water, and other fluids, making ideal for backwashing. It is made with a continuous commercial tensile strength polyester fiber that is circularly woven to offer reinforcement. Hence, it is among the most durable lay flat backwash hoses on the market today and is made with standard guide making it perfect for both commercial and residential use. Another feature of the pipe is the UV resistance ability, making able to withstand harsh outdoor conditions and perfectly suited for use in spas, pool, and other open-end water discharge purposes like farm use. It is also resistant to oil, grease, acids, and other chemicals. Backwashing your swimming pool filter is critical for keeping your pool clean and the Pool Central 32750840 removes waste water from your filter effectively. Due to its heavy duty nature, the hose is quite durable and will offer you services for many years. The hose is tested for pressure to ensure that it can withstand the heavy backwash functions. And you will be astonished at how easy you can roll it when you want to store it. It is made of heavy duty PVC material that also happens to be UV resistant. With a huge diameter of 1.5 inches, the hose can fit most pool filters, but always ensure that your filter is at most 1.5 inches before you buy this hose. It is also very affordable and will last for years. If you would like a hose that will outlast most backwash hoses on the market today, then you might consider the HydroMaxx 4 Bar Hose. Considering its price, this is a great hose to buy and will offer you the service that you bought it to provide. 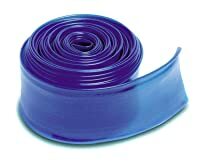 The cover and the PVC tube of the hose are extruded to provide maximum bonding as well as high quality. It is also made with constant high tensile forte fiber circularly woven to offer reinforcement that withstands heavy pressure. Moreover, the hose is UV resistance and can handle a high temperature of 5 to 149 degrees F. It is a great hose for all pool owners. Measuring at only 50 ft. longs, this hose is a shorter compared to the other models we have reviewed in this list. However, it is one of the most affordable and most effective filter hose you will ever get. Actually, it is quite durable and you can always depend on it to provide the backwash you need. Perfect for pool maintenance, the hose is made with heavy-duty material and is well woven to ensure that it can withstand the heavy use. The product also withstands heavy temperature, meaning that you can use it in any kind of weather. It is also UV resistance and oil resistance. The hose will come in handy and offer value for money. Size and diameter – It should fit in your pool filter. Material – You hose should be made of heavy-duty material. Flexibility – The hose shouldn’t kink. Durability – It should offer you years of backwashing. Weight – The hose should be light enough to carry around. Maintenance – Get a hose that is easy to maintain. Q: What is the best backwash hose for my pool? A: The best hose is the one that fulfills your needs and last long. Look at the features of every hose and choose the one that matches the features you want in your hose. Also, go for what you can afford. Getting the best pool backwash hose is an easy process if you know what you are looking for. Choose a hose that is bigger than your pool filter to ensure that it will fit without needing any alteration.